While official bad debt numbers in China are rising fast as its economy weakens, risks in the country's banking system probably remain greatly understated. Now that signs of troubles abound in China, such as idle capacity in some industries, questions are arising about whether data from lenders and the government reliably illustrates how well-equipped the nation's banking system is to face any bad debt crisis. Some outside estimates based on corporate profitability suggest that the situation is far more alarming than indicated by official figures, which can be skewed because of differences in the way NPLs are recognised in China and elsewhere. Further complicating matters, shadow banking, which is hard to capture fully in China, is rampant in the country. For the treatment of bad debt, the standard international practice is to classify loans as nonperforming if they are overdue for 90 days or more, according to CLSA. 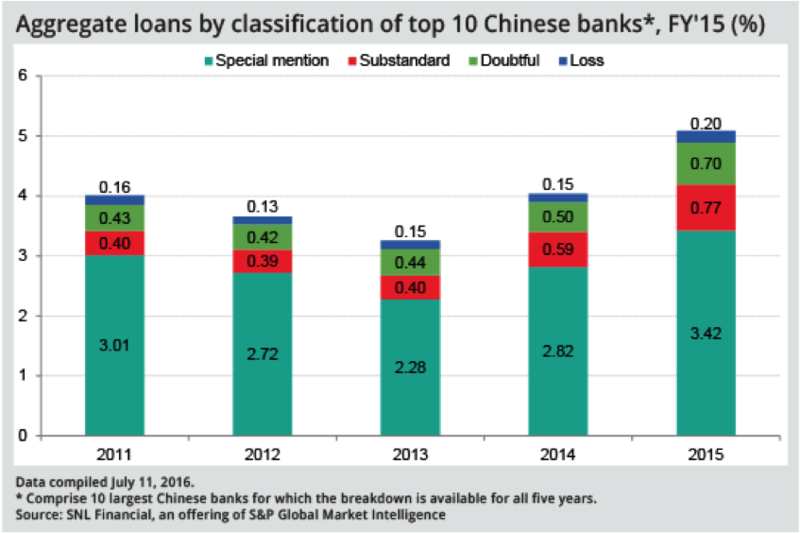 In China, banks tend to delay the recognition of NPLs longer than the norm, CLSA said in a May report. CLSA estimates that China's NPL ratio could be as high as 19%, based on an analysis of financials of listed companies for 2015. The firm arrived at that worst-case scenario by expanding the scope of NPLs to any debt held by companies with insufficient Ebitda to cover 2x interest expenses. In its April Global Financial Stability Report, the IMF cautioned that 15.5% of all corporate loans in China are at risk, calculated by counting companies whose liabilities exceed profit by any margin. Shadow loans are estimated to have ballooned to 21 trillion yuan, about 10% of total bank assets, as of the end of the first quarter from 6 trillion yuan as of December 31, 2012, growing at a compound annual rate of 46%, Deutsche Bank estimates show. In a fast-growing type of shadow lending, a bank uses an intermediary such as a trust company, a brokerage, an insurer or a mutual fund to set up a special purpose vehicle which makes loans to companies. The bank then books the holding as an investment receivable other than a credit asset. Loans appearing as investment receivables surged more than 15- fold from the end of 2012 to make up almost 70% of banks' shadow financing as of March 31, according to Deutsche Bank. A lack of comprehensive data makes it difficult to get the full scope of how much shadow banking credit in China is turning bad. If a 15% NPL ratio is applied, CLSA estimates that there is 4.6 trillion yuan of soured debt in that space, or 4% of GDP. Using a similar top-down approach, the IMF calculated that losses from shadow products for banks could be US$98 billion, or about 656 billion yuan. Although such a situation remains a remote possibility, if stress in the banking system reaches a dangerous level, the government is highly likely to come to its rescue. The state has been taking steps to help banks deal with NPLs as well, such as creating asset management companies that buy bad debt and allowing select lenders to securitise soured credit. Stress in the struggling energy sector, in particular, is showing up on the books of some lenders. Take Chang'an Bank. The lender is based in the capital of Shaanxi province, where the energy industry accounts for more than 60% of corporate revenue, and all of its branches are in that region. NPLs at the bank had ballooned more than ninefold at the end of 2015 from two years earlier, according to S&P Global Market Intelligence data. The four largest national banks, meanwhile, reduced their exposure to energy companies from 2011 to 2015. 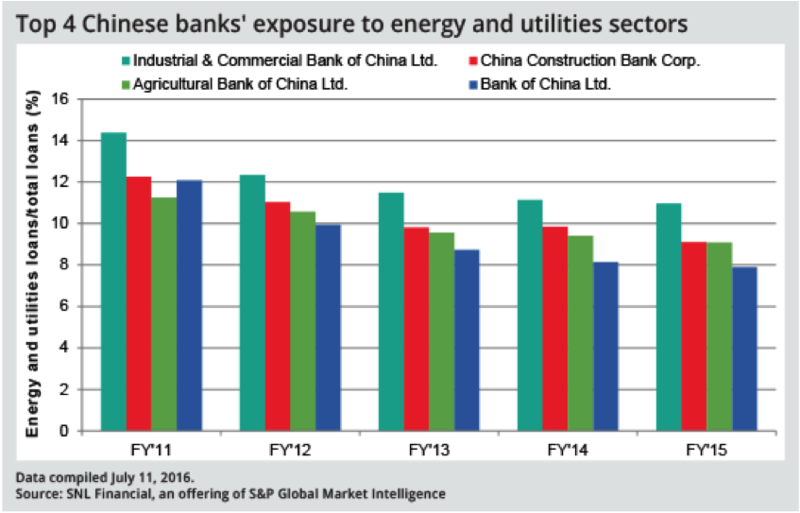 At Bank of China, credit to energy and utilities firms shrank to 7.9% of total loans at the end of 2015 from 12.08% four years earlier, according to SNL data. Industrial & Commercial Bank of China cut the figure to 10.96% from 14.38%.Chinese banks may be turning cautious about lending to risky borrowers, but their asset quality will likely continue to deteriorate. Their reported NPL ratios will climb as defaults on existing loans gradually surface, according to Daiwa Capital Markets, adding it could take as long as a year before a loan becomes nonperforming. The article is authored by Jolie Ho and Francis Ian Garrido at S&P Global Market Intelligence.